NOTE from DearMYRTLE: The following was just received from our friend Kathy Meade of Genline.com. Please address all inquiries to her directly usinfo@genline.com. Mark your calendars! A group of Swedish genealogists from Sweden and representatives from Lantmäteriet will be touring the United States in September giving presentations on Swedish genealogy and historical maps as well as helping persons to discover their Swedish heritage. See below for more details. This month we are highlighting our offer for new customers to Genline which includes a 3-month Genline subscription with the book, Your Swedish Roots. Also, you will find information about Swedish genealogy events and the availability of some Swedish American Genealogist journals online. We are highlighting our product that we offer to first time Genline customers, a 3-month Genline subscription with the book, Your Swedish Roots, written by Per Clemensson and Kjell Andersson for 595 SEK (about $92 U.S and $92 CN). The book is a step-by-step guide instruction for the North-American Swedish researcher showing how to trace one's Swedish roots and how to research using the Swedish church books. There are four case examples in the book using the Swedish church records with explanations of the various record types and then pointing out the next research steps. Limited to first-time North American Genline customers. Mark your calendars! SwedGen 2011 will occur in September. Have you hit a brick wall in your Swedish research or don't know where to begin? A group of Swedish genealogists will be visiting the United States in September to teach and assist Swedish-Americans in how to find their roots and how to do Swedish research. This year representatives from Lantmäteriet, the Swedish mapping and land registration authority, will also be present at the SwedGen events presenting information about Swedish historical maps. 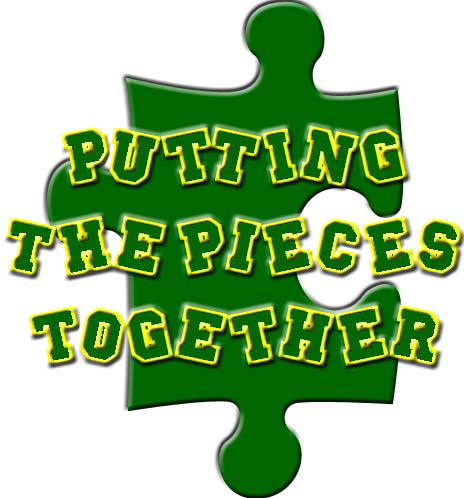 Details and event locations are still being finalized. More details will follow in future communications. Kathy Meade will give a presentation titled "Swedish Genealogy: A Discussion of Resources" at the Kane County Genealogical Society in Geneva, Illinois on Thursday, February 24th. Many issues of the Swedish American Genealogist journal are now online and free to the public. Issues as recent as 2007 are available. The Swedish American Genealogist is a valuable resource for anyone interested in Swedish genealogy and culture. NOTE from DearMYRTLE: The following was just received from our friends at the National Archives (US). Please address all inquiries to public.program@nara.gov. Washington, DC. . . The National Archives presents a special series of programs in February including book talks, a presentation on espionage in the Civil War, and a screening of three parts of Ken Burns’ The Civil War, inspired by Part II, Consequences, of the Discovering the Civil War exhibition. The programs are free and open to the public. While most of the programs will be held in the National Archives Building in Washington, DC, one of the programs will be held at the International Spy Museum, and one will be repeated at the National Archives at College Park, MD. For programs in the William G. McGowan Theater and in the Jefferson and Adams Rooms of the National Archives Building, please use the Special Events entrance on the corner of Constitution Avenue and 7th Street. Discovering the Civil War Part II, Consequences, is featured in the Lawrence F. O’Brien Gallery of the National Archives Building in Washington, DC, and runs through April 17, 2011. The exhibit peels back 150 years of accumulated analysis, interpretation, and opinion to reveal a Civil War that is little-known and even more rarely displayed. The exhibition offers visitors the chance to join researchers in unlocking secrets, solving mysteries, and uncovering unexpected events in the Civil War records of the National Archives. Museum winter hours (through March 14) are 10A.M. to 5:30 P.M. daily. The exhibition is presented by the Center for the National Archives Experience and the Foundation for the National Archives. American painter Winslow Homer rose to national attention during the Civil War, but one of his most important early paintings, “Near Andersonville,” remained unknown for a century. In this illustrated lecture, author Peter Wood reveals the long-hidden story of this remarkable Civil War painting. Wood examines the interplay of symbolic elements and links the painting to Abraham Lincoln’s presidential campaign of 1864. Wood’s provocative study offers a fresh vantage point on Homer’s early career, the struggle to end slavery, and the dramatic closing years of the Civil War. A book signing will follow the program; the book is available at a discount from the Archives Shop (202-357-5271) before and during the event. In An Example for All the Land, author Kate Masur discusses Washington, DC, during the period of Reconstruction after the Civil War. The city became a laboratory for political experimentation as the question of racial equality produced a debate about black Washingtonians and their demands for public respect, equal access to employment, public services, and the right to vote. A book signing will follow the program; the book is available at a discount from the Archives Shop (202-357-5271) before and during the event. Tuesday, February 8, at 7 P.M.
During the Civil War both sides conducted intelligence operations. Despite the often disorderly nature of these efforts, there were successes, including the use of Union codes to protect communications. Both sides also effectively used agents to gather and report information. Clayton D. Laurie, historian for the Center for the Study of Intelligence at the Central Intelligence Agency (CIA), moderates a panel including Donald E. Markle, author of Spies and Spymasters of the Civil War; Ann Blackman, author of Wild Rose: Rose O’Neale Greenhow, Civil War Spy; and Ken Daigler, former CIA employee and author of Black Dispatches: Black American Contributions to Union Intelligence During the Civil War. This program is presented in partnership with the International Spy Museum. After a related presentation at 11 a.m., the book group discusses Escape on the Pearl: The Heroic Bid for Freedom on the Underground Railroad by Mary Kay Ricks. Check the Archives Shop (202-357-5271) for book availability and a discount for book group participants. Brown bag lunches are welcome. Damani Davis, archivist, teaches this month’s “Beyond the Basics” archival research skills for genealogists (all skill levels welcome). PLEASE NOTE: The William G. McGowan Theater will be closed through February 19, 2011, to make necessary improvements to the lighting and projection systems. Public programs will continue during this period in alternate venues. To verify the date and times of the programs, the public should call the Public Programs Line at: (202) 357-5000, or view the Calendar of Events on the web at: http://www.archives.gov/calendar. To request an accommodation (e.g., sign language interpreter) for a public program, email public.program@nara.gov or call 202-357-5000 two weeks prior to the event. NOTE from DearMYRTLE: The following is just in from our friends at the Fairfax Genealogical Society in Virginia. This conference is one of Mr. Myrt's special projects. Please address all inquiries to conference@fxgs.org. Over two dozen genealogy vendors! Enjoy an evening learning to solve "Brick Wall" immigrant problems. Learn how studying neighbors and relatives in the U.S. can lead to finding their places of origin. Then follow families in European records when they are not found in the towns where they were supposedly born. Learn techniques to correctly identify difficult families. With more sources coming online all the time, tracing your ancestors across the ocean to their European hometowns has never been easier. Familiarize yourself with some important websites for making your cross-continent connection. Check-in & vendors area opens at 8 am. Classes begin at 9am. These lectures look at a variety of skills including using the Genealogical Proof Standard, telling your family’s story, researching in different sources, and organization. Lecture 1b - The Journey Takers (Huber) Get Leslie’s book The Journey Takers signed after this lecture! Got ancestors in Western Europe? These lectures are for you! Do you research ancestors who have died? Learn about the different type of probate records that could have been created, even when there is no will. Whether you’re new to genealogy or looking to brush up your basic skills, check out these lectures. Lecture 4a - Can I download my family tree? Lecture 4c - What is Collateral Research? Today Ol' Myrt found a database error at FamilySearch.org. when searching for William B. Wright (whom I know to be William Brockerman Wright, married to Emma Yearsley). 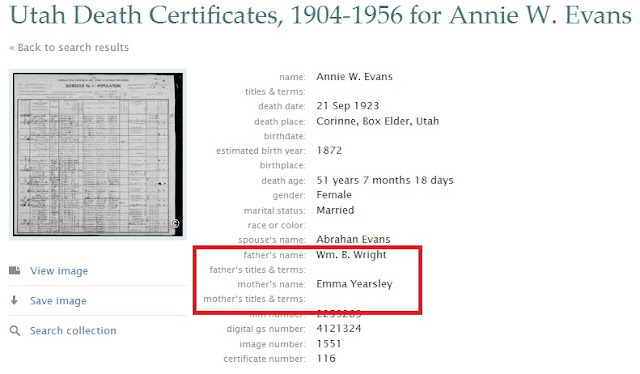 In looking for his Utah Death Certificate at www.FamilySearch.org, I clearly see him listed, twice for some reason. 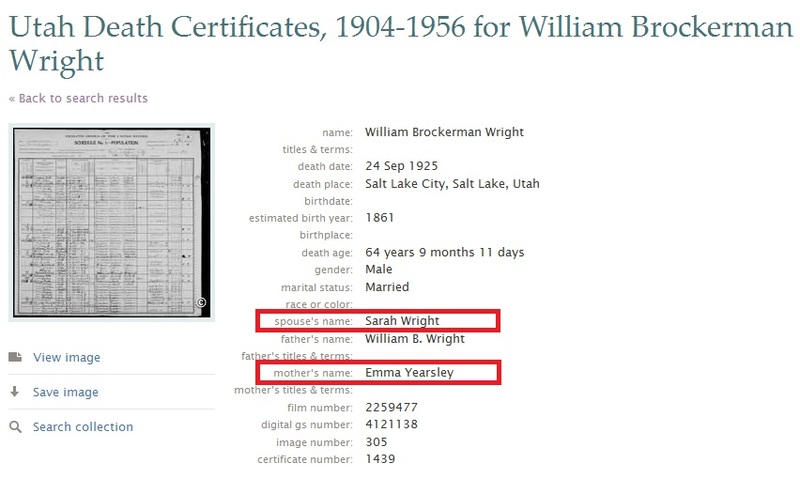 Hit list for William B Wright search in Utah Death Certificates collection at FamilySearch.org. Clicking on the first entry, William B. Wright gives us the following where Emma is his MOTHER, and his known wife is listed as Sarah. In fact the hit list entry is for William the older, BUT the indexed results are for William his son. This also means the hit list screen pulled the name for his spouse from the "mother" section of the database behind the screen. I don't know if the error is in the label of the form, or the data field the form points to. Erroneous indexed entry when searching for William B Wright search in Utah Death Certificates collection at FamilySearch.org. OK, but I still wanted to see the death certificate, so I clicked to view the image but it won't load. There is only a black, unscrollable image where the document should be. So I decided to click on the 2nd entry for Wm. B. Wright where Emma Yearsley is listed as spouse. This returns a death record NOT for Wm. B. Wright, but for Annie W. Evans, where Wm. and Emma are the parents of Annie. Again, I could not load the image in my Firefox web browser. 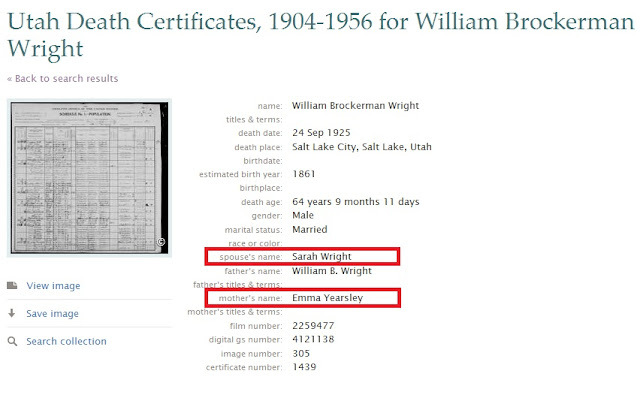 Alas, using the search term William B Wright, and specifying the Utah Death Certificate Collection at FamilySearch.org, I could not find the death certificates for either William Brockerman Wright (died 30 Oct 1916, Salt Lake City, Utah) or his son William Brockerman Wright (died 24 Sept 1925 Salt Lake City, Utah). It would appear that the Utah death records are inadequately searchable, as shown by the woefully incomplete "hit list". The list could easily show wife and spouse of the deceased. Additional searches may require my specifying the death date, something that wouldn't help researchers who don't know already know this information. It is wild that the "hit list" fields don't match the indexed entry fields. A FamilySearch programmer might review how the "hit list" fields are labeled, and to what data field the call is sent. Otherwise, researchers may assume there are NO death records for either of my William Brockerman Wrights. NOTE from DearMYRTLE: The following was just received from our friend Daniel Horowitz of MyHeritage.com. Please address all inquiries to him daniel@myheritage.com. I always look forward to meeting with Daniel, to see what new things are on the horizon for genealogists. Following much planning, emails and international phone calls, I'm ready to start my 2011 Genealogy Tour. As in the past, I'll travel to a number of genealogy conferences, such as: RootsTech, Who Do You Think You Are? LIVE! UK, Ohio Genealogy Society Conference, New England Regional Genealogy Conference, and the National Genealogy Society conference. I'll also take the opportunity to lecture at genealogy societies in many locations. This year, most are on the East Coast of the US. My journey starts with a short trip on February 7 to speak at the Jewish Genealogical Society of Utah, followed by the new RootsTech conference, in Salt Lake City. After speaking at the Albuquerque JCC (New Mexico) on February 13, I head to the Breman Museum in Atlanta, on February 14, were they have prepared a wonderful program including a special visit to the exhibitions. Then to London UK for the JGS of Great Britain on February 24 and the "Who Do You Think You Are Live 2011" the next 3 days. After a short break at home to see my wife and children, there's a long trek beginning March 29 (Dayton, Ohio) concluding May 15 (Washington, DC). My lecture schedule is listed below. However, other talks may still be added. If your organization would like to schedule a talk, contact me at daniel@myheritage.com, and keep up to date with the tour on my personal site, http://www.searchingformyroots.com. I'll be back in the US in June and August, but will write more about that trip later. Pass on the information to those who are interested in genealogy, post it on bulletin boards, and try to attend one of the talks to learn about the latest technology developments in genealogy and receive a free gift from MyHeritage.com. 10 February - RootsTech, Salt Lake City, UT - Enhanced Smart Matches and social networking technologies applied to facilitate collaboration between families and researchers. 25 February - WDYTYA Live 2011, London, UK - Basic Steps for Genealogy Research - How Can I Start My Family Tree? Seems your column Rescue Microfilm Being Thrown Out at NARA NYC generated lots of phone calls and emails. I just heard from Diane LeBlanc with some additional info and a correction. Seems they can only give to non-profits not individuals and it's not on a first come first served basis. The attachments are from her. They need to wait and see if someone is interested in the whole collection before they can even think about sending individual rolls. None of this was discussed in our original phone call. The list has grown quite a bit. She said in going through the film if Waltham already has a copy of the film they are not going to keep a second copy. Unfortunately it will not be posted until the IT people in DC are able to get to work. You will probably hear from her since I sent your email address to her. She said she was getting phone calls from individuals asking for "all the rolls of film that belong to my family." I figure she was really inundated with calls. Thanks for the follow-up. The "all the rolls of film that belong to my family" researcher reminds me of the man who walked into our Family History Center and said "I heard the Mormons were doing genealogy. I stopped by to pick mine up." Posted below is Diane's revised announcement followed by the microfilm list. I'll also modify the original blog post with this update. Film is available only to non-profit organizations. To receive consideration, please e-mail Diane LeBlanc at diane.leblanc@nara.gov. Please include your name, the name of your organization, and a phone number. Please note that the cost of shipping the film needs to be incurred by the receiving organization. Please note, all of these publications will continue to be made available to our local patrons via on line access or upon request from an alternate location where we have copies of these collections. For those of you who previously viewed this list you will note that it has grown. This is because we found that in many cases we had two copies of the same collection in our region. We will keep one copy and the other is now being made available to the non-profit community for donation. To receive consideration, we must have your written request by March 1, 2011. If you have questions you may also call Diane at 781 663-0133. Here is the link to Diane's second attachment, a .PDF file listing available NARA NYC microfilm. No doubt family history enthusiasts will have a heyday looking over the latest collection updates! The 18 million free, browsable digital images are just a sample of what should be a banner year as FamilySearch continues to plug away at digitizing its massive microfilm collection for online access. U.S. researchers will be excited to begin poring over the 3 million new digital images of U.S. naturalization records included in this update. Patrons will also find 72 million new, searchable, indexed records to search for free thanks to FamilySearch's cadre of online volunteer indexers and agreements with Ancestry.com and findmypast.com. Findmypast.com's index to the 1881 and 1891 England and Wales censuses and Ancestry.com's indexes for U.S. border crossings from Canada to U.S. and Mexico to U.S. can now be searched free of charge at FamilySearch.org. See the table below for additional details of the latest collection updates. Canada, Ontario Deaths, 1869-1937, and Overseas Deaths, 1939-1947 188,756 Index only. Canada, Ontario Marriages, 1869-1927 363,464 Index only. Canada, Quebec Notarial Records, 1800-1900 71,036 Notary records from Montreal and Terrebonne. England, Bristol, Church of England Parish Registers, 1538-1900 271,298 Index only. England and Wales Census, 1881 30,262,586 Index only. Images available at findmypast.com. England and Wales Census, 1891 31,782,845 Index only. Images available at findmypast.com. Guatemala Civil Registration, 1877-1934 2,085,501 Images have waypoints. Jamaica, Civil Birth Registration 305,360 New records added to existing collection. Images were already published. Netherlands, Civil Registration, 1792-1952 4,180,580 Images and waypoints added for Drenthe, Gelderland, Groningen, Limburg, Overijssel, and Utrecht. Nicaragua, Managua, Civil Registration, 1879-2007 1,263,191 New images. Philippines, Manila Civil Registration, 1899-1994 1,972,249 New images. Poland, Radom Roman Catholic Diocese Church Books, 1654-1946, Part 1 254,375 Digital images of baptism, birth, marriage, burial and death records for parishes in the Radom, Poland, diocese. U.S., Border Crossings From Canada to United States, 1895-1956 4,335,400 Data courtesy of Ancestry.com. U.S., Border Crossings From Mexico to United States, 1903-1957 3,610,754 Data courtesy of Ancestry.com. U.S., California, Northern U.S. District Court Naturalization Index, 1852-1989 581,198 Images and waypoints added. U.S., California, Southern District Court (Central) Naturalization Index, 1915-1976 567,808 Images and waypoints added. U.S., Illinois, Northern District Naturalization Index, 1840-1950 1,493,775 Images and waypoints added. U.S., Massachusetts Deaths, 1841-1915 200,672 18,134 New records and images added to the existing collection. 2,126,586 records were moved to this collection from the legacy collection. U.S., Massachusetts Marriages, 1841-1915 72,760 15,110 New records and images added to the existing collection. 1,083,931 records were moved to this collection from the legacy collection. U.S., New England Naturalization Index, 1791-1906 635,867 Images and browse entries are available. U.S., Rhode Island, State Census, 1935 693,472 693,472 Contains information from index cards created for each person in the 1935 state census. Wales, Probate Abstracts, 1773-1780 186 New images. For those of you who are following Ol' Myrt's 2011 January Organization Checklist are aware that on the 31st (this coming Sunday) we're scheduled to participate in Scanfest from 11am to 2pm Pacific US time. Even if you haven't been following the checklist, ALL are welcome to participate in scanning old photos and documents. "The January 2011 Scanfest will take place here at AnceStories next Sunday, January 30th, from 11 AM to 2 PM, Pacific Standard Time. Scanfest is a great time to "meet" other genealogists, ask questions about scanning and preservation, and get the kick in the pants we all need on starting those massive scanning projects that just seem too overwhelming to begin." It isn't necessary to join in the online Scanfest chat, but it helps pass the time while that scanner is doing it's thing.